This is an all day course, consisting of 6+ hours of classroom instruction followed with the state mandated live fire range exercises that will make for a full day. For the range exercise a student will need eye & ear protection, a handgun and 50 rounds of ammunition. For those that do not yet own a firearm, either a revolver or semi automatic handgun can be provided for use on the day of the class. Arrangements for this must be made with River Valley Training prior to the course date. We believe that this class has information that can benefit everyone that has any exposure to firearms. Participating students are welcome to bring their spouse and/or children 12 years of age or older to sit in on the classroom portion with them, free of charge. *NOTE: This course is a Minnesota permit to carry course and requires a basic knowledge of a handgun. This course is not a basic or introduction to handguns, although some basics are covered, this is a Minnesota permit to carry course. Instructor Rick Bruels is NRA certified and the training is recognized by several states, such as Arizona, Florida, Iowa, Connecticut, Maine, Virginia, Oregon, Idaho, Wisconsin and others for carry permit training. If you are interested in permit from other states, please contact us and we will explain the different possibilities and determine what fits your needs. Rick is a certified NRA Pistol Instructor, NRA Personal Protection Inside & Outside the Home Instructor, NRA Refuse To Be A Victim Instructor, NRA FIRST Steps Instructor and NRA Chief Range Safety Officer. Let us know if you or your group are interested in a specific NRA course and we will do what we can to fit your needs. Never fired a handgun before? The NRA has a beginner's course called FIRST Steps that is designed for the novice shooter and is a good place to start for both men and women. It is approximately 3-4 hours long and covers the basics such as nomenclature, safety, operation of a handgun, and concludes with the opportunity to fire several handguns on the range. This course is designed to get the student familiar with presenting, operating and firing their handgun in a skill set for everyday use and a possible reactionary situation. Equipment required to attend this course is a concealment garment such as a vest or jacket, a handgun in a minimum caliber of .38 Special or 9mm Luger (9x19), minimum of 2 magazines or speed loaders, a magazine or speed load holders, a strong side holster, if an IWB holster it must have a re-enforced mouth, no other variations of holsters are acceptable, and 200 - 300 rounds of ammunition. For those that do not own a handgun or the required gear, it can be provided for a minimal fee on the day of the class if prior arrangements have been made with River Valley Training. For the student to get the most from this course, it is limited to a maximum of 8 students per class. 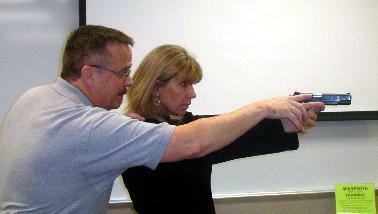 Instruction and Firearms Training Standards for Retired Law Enforcement Officers in Minnesota. Rick Bruels and River Valley Training offers training for retired Law Enforcement Officers that is recognized in Minnesota for the certification that meets Minnesota Department of Public Safety Firearms Training Standards. This course follows the state of Minnesota guidelines as require to apply for the federal carry permit for retired LEO's. We can design a class for one-on-one instruction to meet individual needs or for groups and organizations that have a specific training requirement. Whatever your needs or level of experience, please feel free to contact us with any of your training questions.